Anne Sibley O’Brien, who was raised bilingual and bicultural in South Korea, has illustrated 28 children’s books, 12 of which she also wrote. The Legend of Hong Kil Dong: The Robin Hood of Korea, her first graphic novel, was named a Booklist Top 10 Graphic Novels for Youth, Bank Street College Best Book of the Year. It also received the Asian/Pacific American Award for Literature, and the Global Korea Award. I was born in Chicago where my dad was in medical school. Our family moved to New Hampshire on my first birthday. AO: When I was seven, my family moved to South Korea where my parents worked as medical missionaries. I grew up with two languages and two cultures, being embraced by people who didn’t look like me. In 1960s Korea, I was a spectacle. Every time I went to the market I attracted a crowd of curious onlookers, commenting in wonder at my light hair, my big round eyes, my large nose, my height, and everything else that looked strange to them. The attention was almost always positive, kind of like the way people would treat a princess. These experiences made me very aware of race – mine and others’. Differences were fascinating! Meanwhile our family had close relationships with many Koreans, as friends, working partners and extended family. This taught me that we are all members of one human family. AO: From the moment I could hold a crayon, I loved drawing. By the time I was seven, I was telling anyone who asked that I wanted to be an artist when I grew up. That never changed. I majored in studio art in college, and decided I wanted to be a children’s book illustrator. Later, as I was becoming an illustrator, I started taking my writing more seriously, first as a way to generate stories that I could illustrate, then for its own sake. These days I juggle three loves: writing, illustrating and performing. Right now I’m particularly focused on jazz vocals in performing. AO: I loved the pictures in the many children’s books I grew up with (our home was always full of books), by classic illustrators such as Eloise Wilkin, Robert McCloskey, Garth Williams, and Jesse Wilcox Smith. My favorites were fairy tales, books about fairies, and anything with children, especially babies. Growing up, I loved Korean art, both scholarly brush painting and brilliantly colored folk art, but I didn’t find a way to express that attraction for many years. AO: I never imagined doing anything else! AO: The experience of growing up in Korea sparked a passion in me for the beauty and glory of human difference, which has been the subject of my work in children’s books. I’ve also been fascinated by the puzzle of racism and everything else that gets in the way of seeing our human connection across all difference. Race is one of the primary lenses through which I view the world, something I think about every day, and it affects everything I do. AO: My college studio art immersion was essential to the development of my work because though I drew fairly well, I’d actually had very little art instruction before that. It was amazing to see things for the first time – white space, line, texture – and make conscious choices about how to use it. I spent my junior year as an exchange student at a Korean women’s university (the largest in the world) studying Korean arts: brush painting, embroidery design, ceramics and dance. Thirty years later, this work was the inspiration for the style I used for my graphic novel, The Legend of Hong Kil Dong. There was no applied arts instruction at my college, so everything I know about illustrating children’s books I learned by taking workshops from illustrators (Eric Carle and Ed Young were two important mentors) and by showing my portfolio at publishers and getting feedback from art directors. AO: I work primarily in watercolor, watersoluble pastel, and brush and ink. AO: I’ve illustrated thirty children’s books, only one of which is a comic. But that inspired me so much that I now have two more graphic novel works-in-progress. 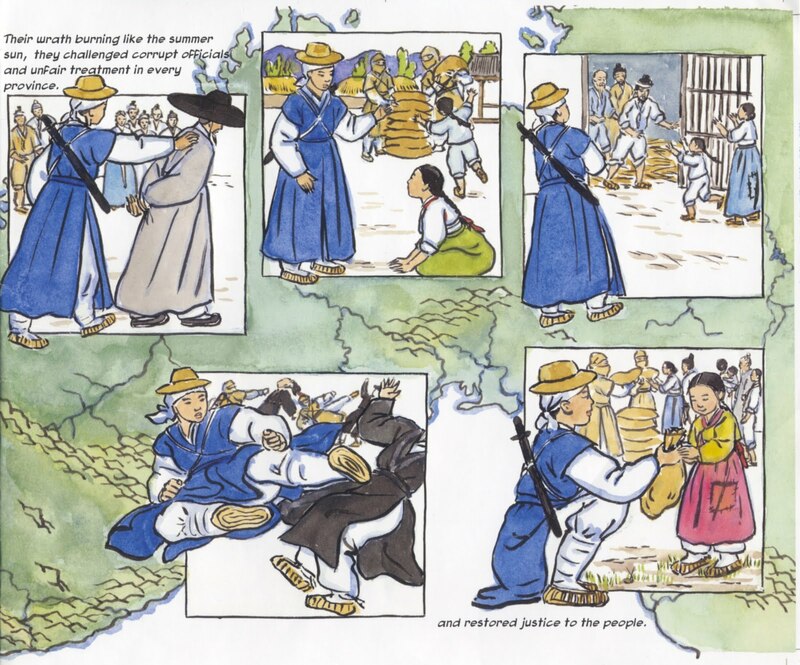 AO: Retelling and illustrating the Korean tale of the hero Hong Kil Dong was a highlight of my work life. I discovered comics! Working in a new medium, in a genre to which I was an absolute newcomer, was a wonderful experience of “beginner mind” – full of discovery. It introduced me to a whole new mode of expression, reinvigorated my way of working and thinking visually, connected me to a whole new audience of Korean-Americans, and reconnected me to my Korean upbringing at a whole new level. AO: I was thrilled to be asked! It’s an honor to have my work presented alongside these incredible artists, and I’ve loved the time I’ve spent with some of them at conventions. Alex is a visionary. AO: My commitment to ensuring that children’s books, including comics, fully represent all our children, is a lifelong one. In all my art and writing I seek to portray a diverse community in which all children can find themselves reflected, and in which they can all discover themselves in each other, across all kinds of difference. In the last two years, I’ve illustrated picture books about characters who are African-American, Korean-American, Iranian-American Muslim, and Cambodian-American. Our daughter was adopted from Korea; being the parent of a child of color added fuel to the fire of my passion for multiracial and multicultural work. Our son by birth, who is white, needed diverse books just as much for his own health and growth. In addition to creating portrayals of children of color, I’m involved in advocating for more access to publishing for writers and illustrators of color. Although there is an incredible body of work about people of color in current children’s books, the percentage is still way too small in comparison to who we are as a nation, especially when you look at the creators – still mostly white. This is unconscionable. It’s essential that all of our children be able to see themselves – and to see each other – in our books and comics. To get the best, most authentic work, people have to be able tell their own stories. I’m part of a vocal movement of writers, illustrators, publishers and others in the children’s book field that’s seeking to address this. In particular, I’m trying to articulate for the gatekeepers how unconscious white bias plays a role in what gets published. AO: I have about a dozen works-in-progress: novels, picture books, graphic novels, a memoir/family history, and even (long-range!) a musical review. But my primary goal is to listen and to be directed by something larger than myself, allowing the creative spirit to move through, transform my work, and bring into form whatever is the best use of my skills. AO: 1. Draw, draw, draw. Take your sketchbook everywhere and draw everything you see. There is no substitute for strong drawing skills, no matter what medium you’re using. 2. Experiment with every kind of material and media you can get your hands on: all kinds of pencils, markers, pens, brushes, paints, papers, digital applications, etc. Finding the right combination, the one that makes your own style come alive, could change your life. 3. Take risks and let your own original vision emerge. Imitating successful artists is a great way to learn, but to get published you need to find your own unique way of seeing things.